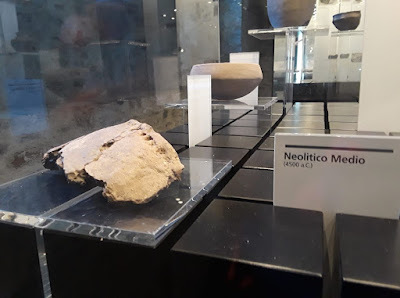 Photo: The Institute of Archaeology, Tel Aviv University/Courtesy Ze’ev Herzog. 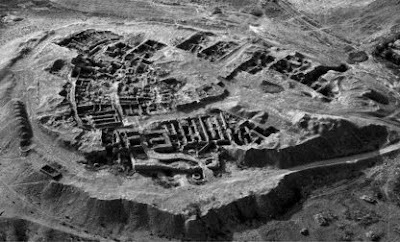 Iron Age settlements excavated in Judah and Edom reveal that the houses were oriented to the rising sun. 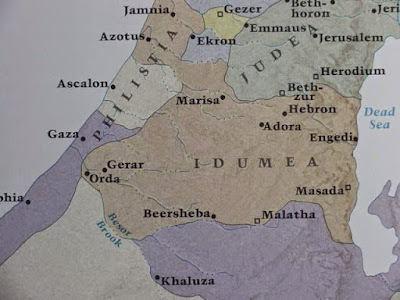 This is what Avraham Faust, Professor of Archaeology at Bar-Ilan University, noticed in his excavation at Beersheba, the southern boundary of Abraham's territory in Edom. The arrangement, as show in the photo above indicates that a westerly orientation was avoided. Abraham's territory extended between the settlements of his two wives. Sarah resided in Hebron and Keturah resided in Beersheba to the south. This was his territory about 1000 years before the Iron Age (c.1200-550 BC). The Iron Age settlement at Beersheba demonstrates its ancient residents preferred their houses oriented to the east. Of the houses excavated at the site only one in 29 doorways was built facing west. Abraham Faust argues that Israelite cosmology is responsible for this pattern. However, the pattern is found among other peoples in settlements that are even older. The Sun was a sacred symbol for many biblical peoples among whom the Hebrew were living. It represented the Creator who was known by many names: Ra, Ani, Azu, YHWH, El, etc. 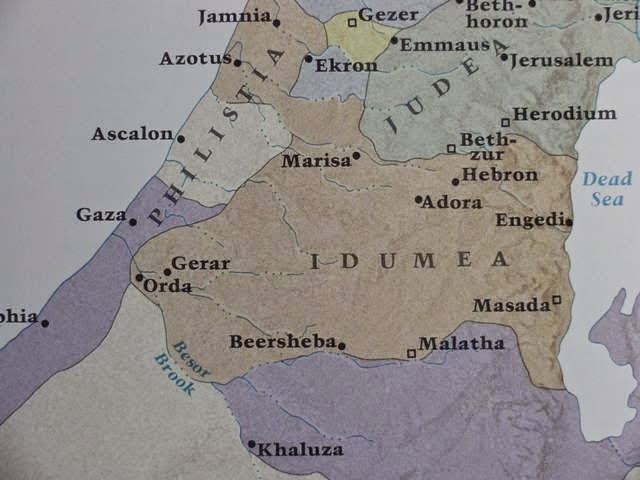 Both Edomite and Midianite pottery have been discovered at Beersheba. A four-horned brazen altar identical in structural to the altar used later by the Israelites was uncovered in 1973. This discovery was made by a team under the direction of Yohanan Aharoni and Ze'ev Herzog of Tel Aviv University. The team encountered an ancient storage wall that contained the stones of the altar. Three of the stones still had large horns projecting from them, but the horn of the fourth stone had been broken off. Yet still another stone had the carved image of a serpent, probably indicating Kenite construction. The stones, which had been incorporated into a wall, were reassembled to assume their former shape and dated to the time of the Patriarchs. The altar may have been destroyed during Hezekiah’s attempts to eradicate all shrines outside Jerusalem. Beersheba had strategic importance because it was the largest settlement in the Negev. It guarded the trade routes between Mesopotamia and Egypt and between the Nile Delta and Southern Arabia. Its fortifications in the late Iron Age were impressive and included a moat that encircled the city and a steeply-sloped earthen rampart. Beyond the rampart the city was surrounded by thick stone walls. The gate was a chambered type, and inside the gate archaeologists found an incense altar at the high place, just as described in II Kings 23:8. The miners of this region venerated Hathor, the mother of Horus, called the "son" of God.